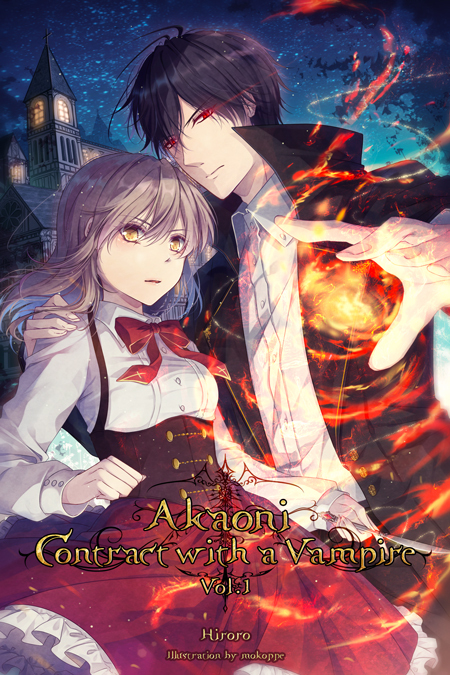 This review is for the first volume of Akaoni: Contract with a Vampire. This series is written by Hiroro and features illustrations by Mokoppe. The first installment of the English translation of this web novel series was released as an ebook by Cross Infinite World on July 31, 2017. No word yet on when the second installment will release. Special thanks to Cross Infinite World for providing a review copy of this volume. A thriller about vampires, with a romance subplot? That’s what Akaoni is, and I imagine just saying that is enough to send some readers flying. I had my reservations at first too, admittedly. I still remember when it seemed every third YA novel in English was a supernatural romance, and especially stories featuring vampires flooded the market. But after reading through volume 1 of Akaoni, I have to say if you’re not fully against the subgenre, this story is well-worth a shot. I was pleasantly surprised with this one. It’s as they say… what was old is new again! The story features a girl named Azusa, who is kidnapped by vampires–and then is saved by other vampires, who then take her away to their vampire town to protect her from yet more vampires. The plot deals with her finding out why vampires are after her specifically, and unraveling the past of the vampire bodyguard named Kouya. Within his clan, Kouya is both powerful and infamous, and for certain reasons he is disinclined to drink blood. Azusa is a fish out of water and Kouya is a maligned pariah, so they’re both easy to sympathize with. I enjoyed their interactions throughout the novel, and liked the way their relationship was handled. And though most of the story is told from Azusa’s point of view, there are chapters where we get Kouya’s viewpoint as well. Sometimes the chapters’ content will even overlap a bit, so that readers can understand why both characters act the way they do during certain events they’re both a part of. I found it all rather refreshing actually, being able to clearly see where both characters are coming from. Their relationship developed at a pace that felt natural–neither too fast nor too slow. The rest of the cast is also filled with likeable characters. One of the villains in particular stood out to me, but I’ll leave the details of that character’s story arc a surprise for readers to find out. The overarching storyline is a little complicated, considering there are multiple factions and mysterious plots to keep track of–but overall I found this volume grounded enough through its strong characters and their engaging dialogues. I think fans of adventure shoujo manga such as Yona of the Dawn will find Akaoni has a similar feel to it, and will particularly like the lead characters. If the premise for this one piques your interest at all, I recommend picking it up. You can purchase the ebook online via sites like Amazon. This is an affiliate link, so a small percentage of sales goes toward this site.